Eating is not a bad thing, but excessively consuming food is an alarming trait that often leads to serious health complications, such as, heartburn. According to the latest statistics, heartburn is one of the most common digestive disorders. It “appears” or is described as, when stomach acid backs up into the tube that carries food from your mouth to your stomach. If the problem is left untreated it can cause damage to the esophagus, lungs, vocal cords and throat and can cause acid reflux, as well as cause pneumonia, ulcers, and breathing problems. This condition can quickly become unbearable by the sufferers because of chest pain experienced after meals and throughout the night. To treat heartburn, prescription proton pump inhibitors (PPIs) are used to reduce the production of acid in the stomach. This makes any stomach juice that may reach the esophagus have a less irritating feeling. But, remember that these drugs can have devastating and long-lasting side-effects and multiple studies have shown that 70% of patients taking them don’t actually need them. A recent study, conducted by group of experts at the Johns Hopkins Bloomberg School of Health, has analyzed two sets of data representing more than 250,000 people in an attempt to find a link between PPI use and kidney problems. 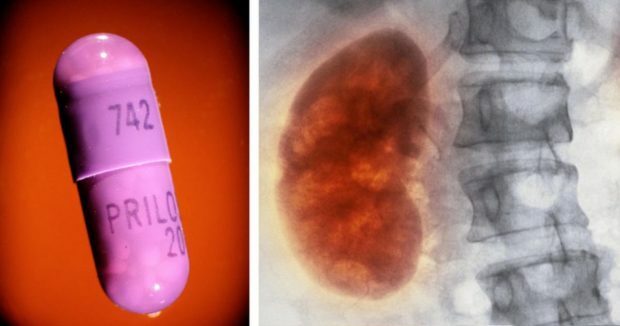 The experts found that regular users of PPIs were 13% more likely to develop chronic kidney disease than acid reflux sufferers that do not take the medication. Other studies have found that PPI use makes patients 20%-50% higher risk of chronic kidney disease. The condition is known to cause toxic overload, fluid retention and central nervous system damage. Study, conducted by scientists at the Stanford University in California, has found that people with gastro esophageal reflux disease (GERD) who took PPIs had a 16 % risk of heart attack. They were also twice as likely to die from cardiovascular problems. Another study has found that the drug may lead to cardiovascular problems. The findings show that proton-pump inhibitors may not only lower stomach acid, they may also affect the health of the blood vessel itself. This is mostly because of the reduced levels of nitric oxide, a chemical which is produced to protect and relax blood vessels. This can lead to an increased risk of heart attack. According to Dr. John Cooke, chair of cardiovascular sciences at the Houston Methodist Research Institute, PPI users are 16- 21% more likely to suffer a heart attack over a 17-year period than chronic acid reflux suffers who were not taking the medication. You should also know that the FDA has issued warnings about the increased risk of osteoporosis and bone fractures associated to PPI use. PPI use of at least 7 years was shown to make patient two times more likely to suffer an osteoporosis-related fracture. The experts also warn that 5 years of regular use was associated with an increased risk of hip fractures. Other affected areas included the wrist and spine. We all know that the stomach acid is important for the body to absorb vitamin B12 and magnesium. Other nutritional deficiencies caused by the drug include calcium and iron. NOTE: acid reflux medication can cause these problems within the first year of use. Unfortunately, supplements cannot remedy these deficiencies as long as the drugs are still being taken. And, one last thing – PPIs have also been linked to pneumonia and Clostridium difficile infection and PPI therapy has led to an increase in hospital mortality in about 90% of patients. NOTE: PPI prescription is an inappropriate treatment for most patients. They claim that all sufferers MUST start by changing their diet, stop smoking or reduce their alcohol consumption. People, stomach acid plays an important role in breaking down food and absorbing nutrients, and also kills bacteria and microbes. And, long-term maintenance use of acid-suppressing drugs like proton pump inhibitors may disrupt these processes and make people more susceptible to both infections and nutritional deficits, experts say. Well, you can fix your acid reflux by taking ½ teaspoon of baking soda in a glass of water after your meal and every two hours until your symptoms subside. Sodium bicarbonate, which your pancreas and kidneys already produce naturally, neutralizes excess acid. You should also know that heartburn can also be caused by your body producing too little acid and therefore not being able to digest your food properly. And, according to the experts, this is especially true for adults over the age of 50. Too little acid is typically caused by poor diet and candida overgrowth. To prevent symptoms, drink 1-2 tablespoons of apple cider vinegar in 8 ounces of water before each meal.